Antoine-Augustin Préault (October 6, 1809 – January 11, 1879) was a French sculptor of the "Romantic" movement. Born in the Marais district of Paris, he was better known during his lifetime as Auguste Préault. A student of David d'Angers, Préault first exhibited at the Paris Salon in 1833. He was not favorably looked upon by some of the artistic community's elite due to his outspokenness and because he was part of the circle of activists who participated in the French Revolution of 1830. 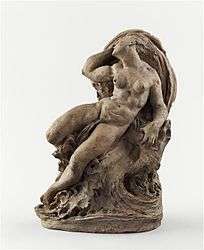 During that period of turmoil, Préault's studio was vandalized and many of his plaster models were destroyed. As a result of these circumstances his work has been largely overshadowed by his contemporaries. "The fever of poetry, the drunkenness of beauty, the horror of vulgarity, and the madness of glory possessed and tormented Préault"
Words of nineteenth century critic describing Préault's work. "Before this retrospective, Préault's work had fallen into oblivion, three masterpieces excepted: La Tuerie (The Killing) (Musée des Beaux Arts, Chartres), Ophelia (Musée d'Orsay) and the Christ in the Eglise Saint Gervais. The exhibition therefore allowed the public to discover anew the great aspects of his work: subjects inspired by literature (Ophelia, Dante, Virgil) ; portraits and medallions (Delacroix) ; funeral sculpture (Silence), which draws its strength from its atemporality ; and such public commissions as the statue of Clemence Isaure in the Jardin du Luxembourg. By the sheer violence of his subjects, the novelty of his compositions and the spirit of his art, Préault may well deserve, as far as sculpture is concerned, the accolade of the greatest poet of unhappiness"
Comments by Musée d'0rsay at time of exhibition held on Preault's work. 1855 This bas-relief won Préault the Prix de Rome for sculpture in 1855. 1869 Huet was an accomplished French painter and Préault executed this medallion featuring Huet in profile in around 1869. The work was later cast in bronze and used on Huet's tomb in the Montparnasse cemetery. The plaster model is held in the collections of the Musée d'Orsay. Until 1985 it had been held by the Huet family before being given to the museum. 1864 Préault executed several medallions and many of these are held by the Musée du Louvre département des Sculptures. 1838 Devarennes was a doctor practicing at the Paris Hôpital de la Charité. Préault's executed this bronze medallion depicting the French historian Jean-Barthélémy Hauréau. Hauréau was also the curator of the Bibliothèque nationale and a director of the Imprimerie nationale then a director of the Thiers foundation. The date this bronze medallion was executed is not known. 1869 This bronze Préault medallion depicting the "Tête de jeune homme" dates to 1869. It also holds a medallion depicting Thomas Shotter Boys. Preault executed sculptural work for the tomb of Charles-Michel de L'Épée in the église Saint-Roch in Paris. The tomb is located in the chapel of St Suzanne. 1870 These two works were commissioned for the garden of the Château de Fontainebleau. 1861 Préault executed this depiction of Christ on the cross. The figure of Christ is in bronze and the cross limestone. Préault's medallion was used on the tomb of the French actor Philibert Rouvière. For this Paris church, Préault carved a high-relief in wood depicting two angels on either side of a medallion. This church is located at 70 rue de Vaugirard in the 6th arrondissement. Préault's marble bust of Nicolas Poussin can be seen in the musée de Picardie in Amiens. 1853 This limestone sculpture is one of four equestrian statues on the bridge. The others are a Roman warrior by Louis-Joseph Daumas, an Arab warrior by Jean-Jacques Feuchère and a Greek warrior by François Devault. 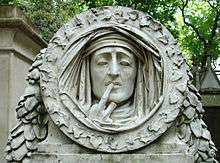 The sculptural work on this tomb is amongst the most remarkable in the Père Lachaise Cemetery in Paris and features the composition "Le Silence"
"The rounded known as Le Silence was created for the tomb of Jacob Robles [1782-1842] in the Jewish section of the Parisian cemetery Pere Lachaise. Abandoning traditional funerary imagery, Auguste Préault fashioned an enigmatic and mysterious evocation of death in the skeletal face which is shrouded in drapery with a finger touching the lips. In part the image drew upon the traditional monastic symbol for silence in the cloisters, but here the sculptor also conveys a sense of ambiguity by leaving open whether the figure is living or dead. When Préault exhibited a bronze cast of Le Silence in 1849, it was hailed as "one of the representative works of modern art" and became an icon of Romanticism"
This Paris church dates back to 1212 and Préault was the sculptor of the church's statue of Saint Gervais. He also sculpted the figure of Christ in the chapel containing the baptismal fonts. It was at this church that a German shell, fired by the long-range "Paris Gun", fell on 29 March 1918 killing 88 people and wounding 68 others; the explosion collapsed the roof when a Good Friday service was in progress. This was the worst single incident involving a loss of civilian lives during the German bombardment of Paris in 1918. Among those killed was Rose-Marie Ormond Andre-Michel, the niece and a favorite model of John Singer Sargent. This church is located in the rue Saint-Antoine in the "Marais" district of Paris. The church contains many fine sculptures including a statue of St Catherine by Préault. Préault executed a medallion for this family grave in the Père Lachaise Cemetery. Préault depicts the head of a woman whose hand covers her face in a stark portrayal of grief. Dijon 1856 This terracotta composition by Préault is thought to date to 1856 and is in fact the only terracotta model of Préault's still surviving. This work is held in Dijon's Musée Magnin. Préault depicts an ondine. It seems that ondines or water-sprites were a popular subject for the writers of "littérature fantastique" and Paracelsus made reference to them in his writings on alchemy. In European folklore they are depicted as fairy-like creatures. This Préault work depicting the French painter Théodore Géricault is held in the Musée des Beaux Arts of Rouen. This bronze medallion is held in Toulouse in the Musée des Augustins. Aulus Vitellius Germanicus Augustus was Roman Emperor from 16 April to 22 December 69. 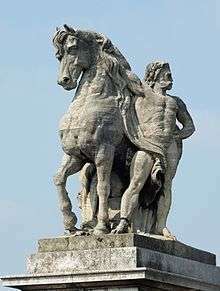 Préault was commissioned to sculpt statues of André Le Nôtre the gardener, and Jules Hardouin-Mansart the architect, for the Château de Versailles gardens. Hardouin-Mansart was one of the most important European architects of the seventeenth century and much favoured by Louis XIV. Le Nôtre was Louis XIV"s favourite gardener and was responsible for the design and construction of the Palace of Versailles parkland. His work represents the height of the French formal garden style, or "jardin à la française". Préault was responsible for the carving of Mary Magdalene in the La Madeleine. Mary is kneeling before some relics. An interesting observation by Préault on the "cult of the relic" popular amongst French intellectuals at the time. 1843 Préault was the sculptor of the statue of Clémence Isaure in the Jardin de Luxembourg in Paris. This was one of a series of sculptures entitled "The Queens of France and Famous Women" comprising 20 marble sculptures arranged around a large pond in front of the Palais du Luxembourg. Louis-Philippe I himself chose the women to be portrayed and most of the sculptures were commissioned around 1843 and for around 12,000 francs each. They were exhibited in the Paris Salons of 1847 or 1848. The musée du Louvre holds a bronze version of the work, cast by Thiebault. Préault was the sculptor of the statue of Jacques Coeur in Bourges. "This sculpture taken from contemporary literature was placed in the Bouzaise Park in Beaune until 1996. At the government's request it was put back in the museum after having been exhibited at the Musée d'Orsay in a one-man exhibition of the sculptor's work. The work is extremely interesting and original. The general movement in a spiral, the violence between the opposition of the position of shoulders and hips, all combine to give this figure a feeling of unrest"
"Ophelia is shown drifting lifeless on the water. With closed eyes and parted mouth, she escapes the stiffness of death. The waves intermingle with the folds of the wet sheet wound around the girl, emphasising the curve of her limbs. Designed like a funerary plaque from the Middle Ages or the Renaissance, the sculpture is nonetheless presented as a picture. Its sad, poetic mood is typical of the Romantic artists' reading of the work of the English playwright"
Extract from Musée d'Orsay article. h.g. : DANTE / ALIGHIERI / NE : A / FLORENCE / 1265 / MORT / 1321"
Tomb of Charles-Michel de L'Épée by Antoine-Augustin Préault in the Saint-Roch church in Paris. The head of Jacques Coeur. Jacques Coeur's statue by Préault is located in Bourges. Antoine-Augustin Préault medallion on Rouvière's tomb. 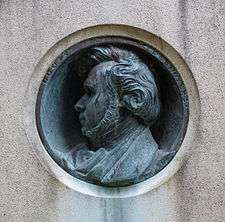 Antoine-Augustin Préault medallion on the tomb of Desnoyers in Père-Lachaise cemetery. Statue of the architect J.H. Mansart at Versailles by Antoine-Augustin Préault. ↑ "Paul Huet". Retrieved 1 February 2014. ↑ "Eugène Delacroix". Retrieved 2 February 2014. ↑ "Sara Stephann". Retrieved 1 February 2014. ↑ "Le Docteur Devarennes". Retrieved 1 February 2014. ↑ "Jean-Barthélémy Hauréau". Retrieved 2 February 2014. ↑ "Arthur de Beauvoisy". Retrieved 1 February 2014. ↑ "Christophe Pittermann". Retrieved 1 February 2014. ↑ "Tête de jeune homme". Retrieved 2 February 2014. ↑ "Lelia". Retrieved 1 February 2014. ↑ "Auguste Vacquerie". Retrieved 2 February 2014. ↑ "Robespierre". Retrieved 2 February 2014. ↑ "Thomas Shotter Boys". Retrieved 2 February 2014. ↑ La Mendicité. Retrieved 1 February 2014. ↑ Vénus et le Sphinx "Vénus et le Sphinx" Check |url= value (help). Retrieved 1 February 2014. ↑ "Jupiter et le Sphinx". Retrieved 1 February 2014. ↑ "Croix de chemin in Ingouville". Retrieved 30 January 2014. ↑ "The tomb of the actor Rouvière". Retrieved 4 February 2014. ↑ "Bust of Nicolas Poussin". Retrieved 1 February 2014. ↑ "Le Silence". Retrieved 1 February 2014. ↑ "Église Saint-Gervais et Saint-Protais". Retrieved 30 January 2014. ↑ "St Catherine". Retrieved 1 February 2014. ↑ La Tuerie "La Tuerie" Check |url= value (help). Retrieved 4 February 2014. ↑ "Monument to the Morin-Chalon Family". Retrieved 2 February 2014. ↑ "Vague". Retrieved 3 February 2014. ↑ "Theodore Gericault". Retrieved 2 February 2014. ↑ "Aulus Vitellius". Retrieved 1 February 2014. ↑ "Adam Mickiewicz". Retrieved 2 February 2014. ↑ André Chénier "André Chénier" Check |url= value (help). Retrieved 3 February 2014. ↑ "Louvre". Retrieved 2 February 2014. ↑ "Louvre". Retrieved 1 February 2014. ↑ Les Arts "Louvre" Check |url= value (help). Retrieved 3 February 2014. ↑ "Louvre". Retrieved 3 February 2014. ↑ "The Louvre angels". Retrieved 2 February 2014. ↑ "Hirshhorn museum". Retrieved 2 February 2014. ↑ "La Madeleine". Retrieved 2 February 2014. ↑ "Sculpture of Mary Magdalenen See figure 9 in article". Retrieved 2 February 2014. ↑ "Clémence Isaure". Retrieved 1 February 2014. ↑ "Statue of Jacques Coeur". Retrieved 1 February 2014. ↑ "Jacques Coeur". Retrieved 2 February 2014. ↑ "François Séverin Marceau". Retrieved 1 February 2014. ↑ "Ondine". Retrieved 1 February 2014. ↑ "Ophelie". Retrieved 2 February 2014. ↑ "Dante". Retrieved 1 February 2014. ↑ "Statue of St.Valère". Retrieved 1 August 2014. ↑ "Details of burial". Retrieved 1 February 2014. 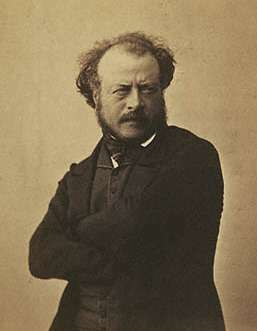 Wikimedia Commons has media related to Antoine-Augustin Préault.